In addition to the latest 8-K filing by A123 Systems, Inc, (Nasdaq: AONE) which reads more like a death watch message to investors, the chart has been saying it all along. Will a cash infusion from strategic investors comes through to save the day for A123 Systems? Looking at the monthly chart dating back to its IPO, I can understand why one trader I know has been short A123 Systems, Inc, (Nasdaq: AONE) since the $10 level; a series of lower lows and lower highs. Now trading just under a buck, the stock is indeed in serious jeopardy as the company itself is questioning its own ability to remain as an operational concern. In plain English, that means the company could go out of business without a rescue. This is not unusual in this space of so-called clean energy. For example, the solar sector has been hit very hard the past few years, especially when cheaper products from China weigh in on the market. Now it appears the lithium-ion battery sector is having its time in the barrel; and A123 is at the center of it with recalls on batteries for the new Fisker Karma. A123 Systems has reported that it has isolated the problem, which it thinks is linked to one machine involved in the manufacture of its prismatic battery cells. Still, A123 Systems will need to replace defective batteries made at its Livonia, Mich., plant, costing the company $55 million. It was just a few weeks ago that the developer and manufacturer of advanced Nanophosphate® lithium iron phosphate batteries and systems announced financial results for the first quarter ending March 31, 2012. Although the company stated its customer pipeline continues to be strong in all target markets, limitations with respect to their manufacturing ramp were also noted; which meant they anticipate revenue in 2012 will be below prior expectations. For the record, the news release stated a gross loss was $90.8 million in the first quarter of 2012, compared to a gross loss of $15.5 million in the first quarter of 2011. Question is: Will these so-called strategic partners come to the company’s rescue? The operative words, however, may involve substantial investments. 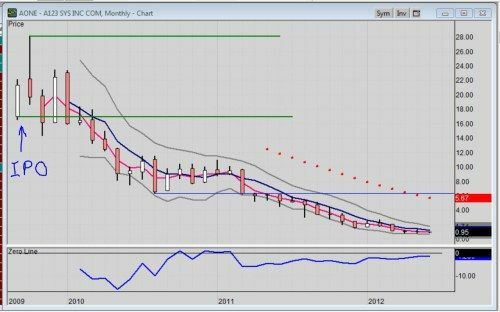 Taking a look at the monthly chart of AONE and you immediately see price dynamics have been stating reality all along. This precisely why I view the technicals as so important to even long-term investors let alone short-tem traders. A123 Systems, Inc. is not fly-by-night outfit; nor is its technology. It is a leading developer and manufacturer of advanced lithium-ion batteries and energy storage systems for transportation, electric grid and commercial applications. The company's proprietary Nanophosphate® technology, for example, is built on novel nanoscale materials initially developed at the Massachusetts Institute of Technology; yes, that‘s M.I.T., folks. It is designed to specifically to deliver high power and energy density, increased safety and extended life. A123 views and touts itself as a company which leverages breakthrough technology, high-quality manufacturing and expert systems integration capabilities to deliver innovative solutions that enable customers to bring next-generation products to market. Based on the recalls, though, the manufacturing processes are obviously not delivering the quality expected; and at a time of ramp up, that is looking disastrous. A number of comments on the web were quick to note a similarity to Solyndra, the half a billion dollar investment by the government which went belly-up. I noticed that some feel this particular comparison is unfounded or unfair. Well, it’s surely not fair to the investors who bought and held on to AONE since its IPO. Other comments point the finger at President Obama's alternate energy impetus plans, which many view now as seriously gone awry. Even with Tesla and its half a billion dollars, many are wondering where the jobs are. But the one comment that struck me most stated that “a technology cannot be forced ahead of its economically feasible time.” Interesting perspective to say the least. Final questions: Who will buy A123 Systems? Who will lend them cash? Who will align with them so as to save the company and the early investors, as the technology is still viewed as viable? I realize they do more than supply cars with batteries, but the fact that you can count on your fingers and toes the number of electric cars being built every day is not helping the business reality. Nor is the Prius C (nickel batteries). Excellent analysis.